The author extols the virtues of Para USA's newest 1911, the GI Expert. The Para GI Expert is a full-size, all-steel gun that offers some pretty high-end features at a very economical price. In the early 1980s, we were not in some golden age of gunsmithing or IPSC shooting--we were struggling with the surplus 1911s that were available. They were often well worn, and almost all of them were in need of improvements to be suitable for "combat" shooting. Going to a Colt was little help. I won a brand-new Colt in 1981, and it wouldn't work at all without a whole lot of gunsmithing. However, that turned out to be a good thing, as I did a lot of the work myself and ended up on the path that led me here. Fast-forward to 2009, and the woods are full of 1911s, built by companies from one end of the globe to another. From basic to tricked-out, you can get a 1911 pretty much any way you want. So why get excited about this new Para? I mean, its "just another GI gun" right? Wrong. To put it bluntly, had Para USA been up and running in 1981 and offered this pistol, it would have put Colt out of business. For a "basic" gun, it has everything the aspiring combat shooter ca. 1981 could have wanted--and pretty much everything you need today. First, it is an all-steel, single-stack Government model in .45 ACP. Up top, it has fixed three-dot sights that are large enough to be seen but small enough to be concealable. If you are not partial to white-filled three-dot sights, they are easy enough to blacken. The ejection port is lowered and sculpted, something shooters paid a lot of money for back in the old days (and, I might add, paid for two or three times occasionally, as not all gunsmiths back then knew what they were doing). The thumb safety is also large enough to be useful and compact enough to be comfortable. In fact, it is pretty much the contour of the Colt Series 70 safety that we all found entirely acceptable back then. It wasn't until later that we all "had" to have the bigger safeties, but truth be told the Series 70 is plenty big enough. Unless you have thumbs like an orangutan, the thumb safety will be perfect for you. The trigger pull is as clean as a good gunsmith back then could make a trigger pull. Today, some gunsmiths can do a lot better, but for a carry or beginner's gun, you don't want a super-light competition trigger pull. You want something light enough, crisp and clean. Which is what the GI Expert delivers. As part of that trigger pull, this new Para uses a lightened aluminum trigger of medium length and a Commander-style hammer--another aspect of the good old days now-forgotten. We used to toss the old GI hammers (many of them "tuned" to a "combat" trigger pull of six to seven pounds) and put in a Commander hammer as a replacement. To make it clear the grip safety when cycling we'd sculpt the top surface of the tang so the Commander hammer's rowel would clear. That is what Para has done here. So you have a crisp, clean trigger pull, a Commander hammer and less bulk in the grip safety. Again, a basic pistol set up very well for concealed carry. 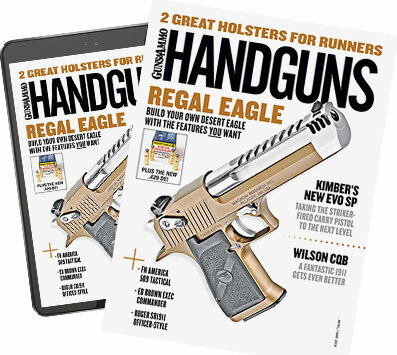 As it takes standard single-stack 1911 magazines, you have your choice from the vast panoply of aftermarket mags or you can use the Para USA mags, which hold eight rounds each. That, too, is a big improvement as we used to have to depend on either crappy USGI mags or expensive and crappy Colts. The GI Expert's ejection port is lowered and sculpted for reliable ejection of empties, a feature you used to have to pay extra for. Also, the mag well of the GI Expert is beveled--an option we paid a lot of money for back then--that you get built into the gun. As part of the GI Expert specs, Para has applied the modern knowledge of feeding to the feed ramp geometry, frame and barrel. No more funky GI guns that feed only hardball; the Para GI Expert feeds it all. The grips are black plastic, the finish is a flat black, the recoil spring is original-style, the barrel has a normal bushing, the barrel is a GI-standard ramped design, and the result is an entirely normal 1911. Looking at it, had the Army had its act together in 1985, it would not have adopted the 9mm but rather would have upgraded the 1911A1 to this and perhaps called it the 1911A2. So why the excitement over this pistol? That was my reaction upon pulling it out of its green plastic box. The GI Expert arrived right on the heels of a slew of high-end pistols, and I had just finished checking out and shooting a bunch of 1911s--factory and custom--the least of which retailed for more than $1,500 and the custom guns stopping just shy of $4,000. I still hadn't gotten any more excited about the Para by the time I took it to the range. I ran a swab down the bore and dry-fired it a few times--and thought, hey, that's a pretty nice trigger for a plain Jane 1911. I loaded it up, aimed at the 100-yard gong and broke the shot. I whacked the gong, which was not all that surprising, but I proceeded to do likewise with the rest of the magazine. I tried it with all the types of ammo I had on hand. What it liked, it liked very well, and the gong suffered mightily for it. What it didn't, it wasn't too unhappy with, and I still managed a pretty good percentage of hits. A proper sight alignment and clean break just about guaranteed a "clank" from downrange. Para USA clearly went to the effort of getting this one zeroed before shipping. To no great surprise, the company also did not skimp on the barrel when building the GI Expert. The tube is stainless and nicely fitted. There's just a bit of play in the slide-to-frame fit, and the barrel clearly locks up consistently. It shoots a whole lot better than a cursory check of the fit might lead you to believe. Not that it is sloppy, but after handling a bunch of guns featuring hand-lapped slide-to-frame fits, anything is going to feel a bit loose. Between the crisp trigger and the top-notch barrel, the GI delivered the goods on that first, and subsequent, range trips. Still, it is a basic 1911, so why should you take note? Simple. If all you want is an out-of-the-box gun to serve your needs, here it is. The accuracy was amply demonstrated. As for reliability, despite the array of ammo I tried in it, it never once gave me a problem. The trigger won't need the tender ministrations of a gunsmith, and you are not going to be chewed up by the grip safety. The thumb safety is plenty good enough, and few of you will really need something different. That won't stop some of you from customizing the GI Expert, which is the second part of the attraction. You can spend a lot of money on a bare-bones 1911, just to get it to where this one is already. A lot of gunsmiths still make a good living tuning a trigger to be as good as this one is, tighten it to be as accurate as this one is and fuss to make it as reliable as this one is. Start with the Para GI Expert, and you've not just started with a leg up on the path to custom-gun ownership because you've just saved all those potential costs: trigger, accuracy, reliability. If all you do is stop with buying the GI Expert, you've saved money. If, however, you want to move on, you can put your hard-earned cash to better uses: adjustable sights if you wish, or checkering, stippling or some other nonslip grip treatment. Swap out the plain plastic grips for something from Techwell, Ahrend, or John VanZyck of VZ Grips. With a basic gun so well-built as your starting platform, you'll get a lot more bang for your accessorizing buck than you would with something rougher. And the best part? The price. For your $599, you're getting a lot of gun. As we all know, MSRP is a fiction that is required for modern commerce, and you're going to find the GI Expert for a lot less than "suggested retail." Lest you think this is not a good deal, a couple of historical comparisons. I bought my first 1911A1 in 1978 for $179. The MSRP on my Colt, won as a prize for a match in 1981, was $277. Adjusted for inflation, that comes to $510 for my GI gun and $625 for the Colt in 2009 dollars. And both of those needed work (the Colt, a lot of work) before they were even close to what the Para GI Expert gives you right out of the box. I certainly put a couple of hundred bucks into each of them, bringing the 2009 costs to more than a grand for either, compared to half that for the GI Expert. And, to restate the obvious, that makes Para USA's new 1911 one heck of a deal. The new Para uses a lightened aluminum trigger of medium length that features a crisp, clean break. The safety is similar to that found on the Colt Series 70--compact for carry but plenty big enough to use easily. The grip safety is sculpted to clear the Commander hammer.